The Gentleman Adventurers is a theatrical troupe specializing in first person historical interpretation of various army and naval officers of the English Elizabethan period. We bring not only interaction on the streets but conduct duels of honor at The Renaissance Pleasure Faire in Southern California each spring. Each member of the Gentlemen Adventurers have conducted serious research on the character that they portray which helps them bring a slice of life to every event they attend and helps them to educate the public in Elizabethan military matters and commonplaces. Furthermore, most of our members are students in The Bankeside Schoole of Defense which enables them to stage realistic swordfights and quarrels over a gentlemen's honor. Who are the Gentlemen Adventurers? 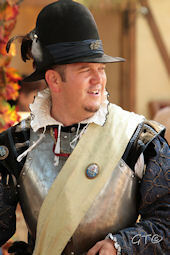 The Gentlemen Adventurers began in 2001 when Mr. Michael Foster, Guildmaster for the Guild of Saint Michael in Southern California, brought together a few veteran faire actors to bring a theatrical aspect to his reenactment group. He asked Mr. Steven Leon to lead his troupe of Gentlemen Adventurers with four other individuals to interact with the patrons of the Renaissance Pleasure Faire in Southern California. Together with the Royal Militarie Academie headed by Mr. Andy Bradshaw, the Gentlemen Adventurers brought to life a group of well-to-do gentlemen and assisted the Militarie Academie in teaching the public Elizabethan military commonplaces. Since then, our group has grown significantly and in 2004, the Gentlemen Adventurers was granted with our own troupe status within The Renaissance Pleasure Faire. 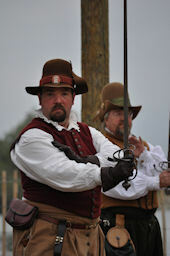 The men and women of The Gentlemen Adventurers now wander the streets of faire with interaction, improvisation and conduct duels and demonstrations in period swordplay. Interaction - With specialized workshops and training, each member of the Gentlemen Adventurers is able to interact with those who visit a specific event whether it is a school presentation, living history event, corporate party or a themed based wedding. Education - Most members of the Gentlemen Adventurers have chosen historical characters to portray and have done exhausting research to ensure their portrayal is as accurate as possible. Additionally, our members have done extensive research in all aspects of Elizabethan daily life, military matters and naval commonplaces of the period. Stage Combat - Most of the members of The Gentlemen Adventurers are current students in The Bankeside Schoole of Defense which enables them to conduct demonstrations with the various weapons used during the latter part of the 16th century in a safe, yet engaging manner. These include such weapons as the rapier and companion weapons, broad and back swords, longswords,quarterstaves and dagger fighting. For more information on The Bankeside Schoole of Defense, please visit our website at http://www.bankeside.org.